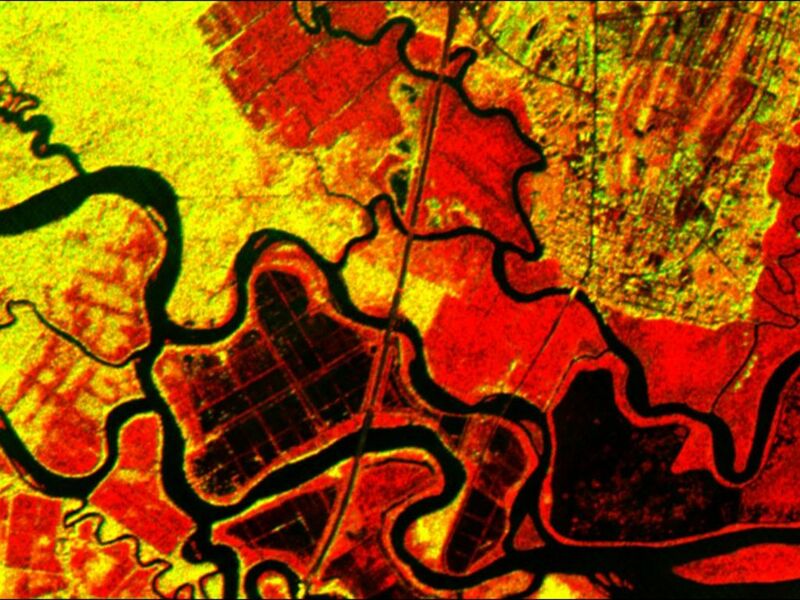 The history of sea islands in the Altamaha River delta on the coast of Georgia is revealed in this image produced from data acquired by the Airborne Synthetic Aperture Radar (AIRSAR), developed and operated by NASA's Jet Propulsion Laboratory, Pasadena, Calif. 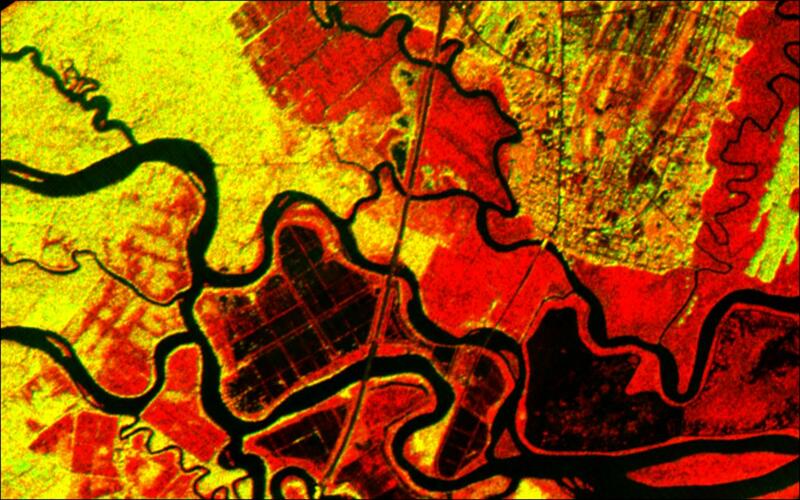 The outlines of long-lost plantation rice fields, canals, dikes and other inlets are clearly defined. 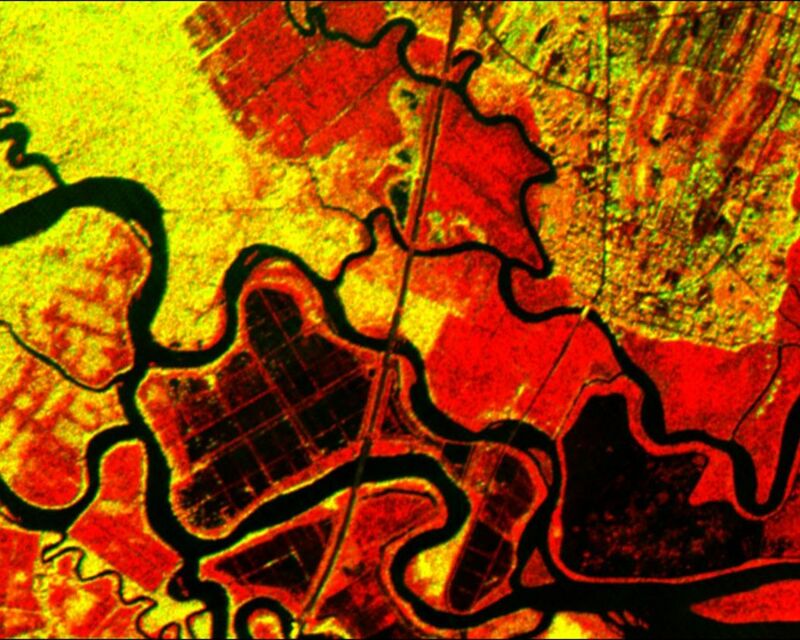 Salt marshes are shown in red, while dense cypress and live oak tree canopies are seen in yellow-greens. Agricultural development of the Altamaha delta began soon after the founding of the Georgia Colony in 1733. About 25 plantations were located on the low-lying islands and shores by the 19th century, taking advantage of the rich alluvial flow and annual inundation of water required by some crops. The first major crop was indigo; when demand for that faded, rice and cotton took its place. A major storm in 1824 destroyed much of the town of Darien (upper right) and put many of the islands under 20 feet of water. The Civil War ended the plantation system, and many of the island plantations disappeared under heavy brush and new growth pine forests. Some were used as tree farms for paper and pulp industries, while the Butler Island (center left) plantation became a wildlife conservation site growing wild sea rice for migrating ducks and other waterfowl. Margaret Mitchell is reputed to have used the former owner of the Butler Plantation as a basis for the Rhett Butler character in her novel "Gone With The Wind," taking the first name from Rhett's Island (lower right). These data were obtained during a 1994-95 campaign along the Georgia coast. AIRSAR's ability to detect vegetation canopy density, hydrological features and other topographic characteristics is a useful tool in landscape archaeology. AIRSAR flies aboard a NASA DC-8 based at NASA's Dryden Flight Research Center, Edwards, Calif. The analysis on the data shown was accomplished by Dr. Gary Mckay, Department of Archaeology and Geography, and Ian Morrison, Department of Archaeology, both of the University of Edinburgh (Scotland). AIRSAR is part of NASA's Earth Enterprise program. JPL is managed by the California Institute of Technology, Pasadena.